We’ve all been on the receiving end of a cold sales email. Some of them offer a compelling case, others get little more than a glance before hitting the delete key. Why do some emails earn your precious attention and leave a lasting impression while others fail? The B2B buying cycle has evolved, and sales teams need to adapt their lead generation strategies to compete with an information-rich digital environment. Email lead generation continues to be one of the most effective ways to land new customers, but striking a chord with your buyer has never been more challenging. 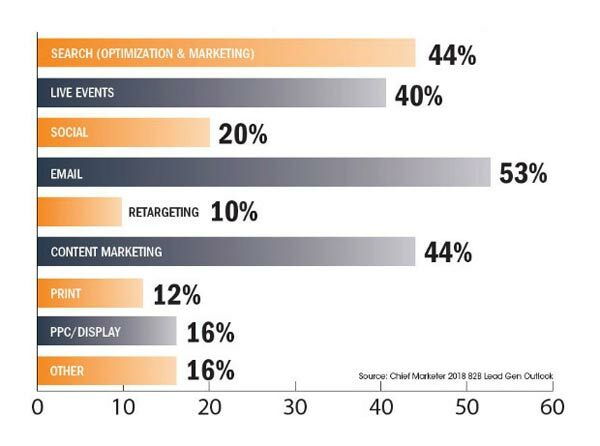 According to the 2018 B2B Lead Gen Trend Survey, Email continues to be the channel that produces the largest source of leads. An effective cold sales email must speak to the decision makers language and clearly deliver the most useful information as quickly as possible. Your prospects have an inbox full of messages that compete for their attention, meaning your message must hit the nail on the head to get noticed. Today’s buyer lives in a world with an abundance of information at their fingertips. To earn the attention of your cold prospects is a tall order, but certainly not impossible. 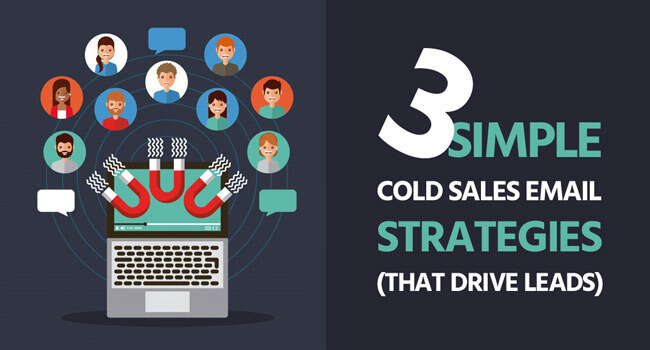 The following cold sales email strategies will ensure your message has a chance to rise above the noise and generate warm leads for your business. The days of sales teams speaking with uneducated early stage buyers are over. Prospects can (and will) do their own online research and are well past the early stages of the buying cycle. If you can identify the buyer persona of your target customer and where they sit in the buying cycle, you have an incredible opportunity to provide them with the exact answers they’re looking for. Chances are, your prospects are up to 75% of the way through their buying journey by the time they receive your message. Keep this in mind, and align your cold sales email messaging with an educated buyer. The over-arching theme of the following strategies is to provide key information to the decision maker quickly. Don’t spend time getting cute with the delivery. The problem with most cold sales email subject lines is that they sound too much like a marketing email. The cliche subject lines that have been used in countless email campaigns quickly find themselves in the trash. A better approach is to clearly identify an answer to a problem. If necessary, sacrifice a little style to make your solution crystal clear. In this case, the subject line addresses the pain point of slow lead generation with a personalized touch. The more personal the subject line is, the higher the open rate. So inject the name of the prospect and their business whenever possible. Never make a statement in the subject line that does not align with the body of the email content. If you pose a question, be sure to answer it clearly in your email. This is where the correlation between your open rate and response/close rate comes into play. Avoid solely paying attention to increasing open rates, as you need to monitor the big picture to assure that your emails are doing what they were designed for in the first place (closing). Looking for more ideas? Check out our 10 best cold email subject lines designed to boost re-engagement. This is a clever tactic when targeting a specific contact at a company, but you’ll have to identify them first. For larger bulk email campaigns, you’ll need a more broad approach. For bulk email marketing to a list of cold contacts, Clickback MAIL gives you the ability to send 100% CAN-SPAM compliant campaigns. The urgency of fixing a current problem in your prospect’s business has the power to stand out from the other emails in the inbox. If you have isolated the common pain points of your target customer, you should know exactly what these issues are. Dangle a solution in front of your buyer in the subject line, and you’ll have a much better chance at increasing your open rate. Focus on making the offer to-the-point, and not overly salesy. If the subject line represents a genuine solution to their problem, getting overly fancy in the delivery will only hold it back. As for the body of the email, continue down the path of the narrative you started. A disconnect early on is all it takes for your prospect to swipe your message off-screen. The opening paragraph should describe the pain point in more specific detail, further gaining the attention of the buyer. The idea here is for the buyer to say (in their head), “that’s exactly the problem we’re having”. Being in sales, I’m sure you’ve experienced this feeling from the buyer end. It’s an impressive level of audience targeting and often leads to a positive response. When you understand where your client is hurting, you can align your product as the solution. Now that you’ve earned the attention of your prospect, it’s time to provide them with an obvious solution to their problem. Don’t make the mistake of wasting this space with a list of your product/service features, as your prospect will quickly lose interest. Instead, use this time to explain how your service can fix an existing issue, and provide massive value to the company. A customer testimonial from a user in a similar situation as your prospect is a great way to introduce third-party validation to your offer. Let them sell your service for you, as this has the remarkable ability to add instant credibility to your offer. By including social proof of your offer, you give the prospect peace of mind. At this point, they may choose to investigate your business further via your website, or better yet, take action on your CTA. To summarize, if your message is too vague and does not address a specific problem in the subject line, the chances of getting opened are slim. You’ll need to be straightforward and direct in your approach to compete against a congested inbox. Never create a disconnect between your subject line and the body context. This leaves a bad taste in the mouth of your buyer and you’ve essentially traded higher open rate for a lower close rate. Propose a clear solution to the pain points of your ideal customer. If you have narrowed your target audience down by segmenting your email list, you should know exactly what these common problems are. The idea of repairing an underperforming aspect of your buyers business demands their attention. The tone of your email should be directed towards the decision maker at the company. Understand that your target buyer is likely more than two-thirds of the way through their buying process, and is educated in your industry. A long list of reasons why your product or service is great will not keep your prospects attention. Use this moment to provide a validation and credibility around your offer from a real customer in a matching situation. The following cold sales email templates and examples are a great way to get the ball rolling. Use these examples to inspire your next campaign, rather than simply copying the format word for word.